Korea suicide rate, at one point, was extremely low for an industrialized country -- only 6.6 per 100,000 deaths in 1986, significantly below the current OECD average of 11.1 per 100,000 deaths. In just 20 years, however, Korea's suicide rate would more than quadruple to 31 per 100,000 deaths. Thus, to understand Korea's suicide phenomenon, we have to understand how Korean society changed from late 1980s to the late 2000s. Sociological studies on suicide strongly suggest that modernization/industrialization entails a rise in suicide rate, and the spike in suicide rate will be higher as a country modernizes/industrializes later. Although there are certain regional variations, the trend is unmistakable: every single country, in the process of industrialization, experienced a spike in the rate of suicide. Even within the same country, an industrialized city experiences higher rate of suicide than a non-industrialized rural area. Korea has been able to avoid the suicidogenic factors of industrialization until the late 1980s, thanks to the East Asian development model that allowed for the country to industrialize while maintaining a sense of community among works. The scheme, however, fell apart in 1997, as East Asian Financial Crisis swept Korea. Koreans faced a very different reality after the East Asian Financial Crisis, the one that was particularly conducive to suicides. What is it about modernization that causes suicide? Modernity comes with capitalism and individualism, which travel hand in hand. Reduced to its core (and thus risking gross over-generalization,) modernity causes suicide because it commodifies individuals. What does it mean to be commodified? In a pre-modern society, people's social identity is defined by their unchanging relationship to the larger society. If you are someone's father, you never cease to be the father (short of a catastrophe.) Accordingly, your duty and worth as a father likewise never change throughout your life. Such unchanging constancy is precisely the character that a commodity lacks. The worth of a commodity is strictly proportional to its usefulness. If the commodity loses its usefulness, it automatically loses all of its value. The commodity, quite literally, becomes worthless. And once rendered worthless, its existence no longer matters. Perniciously, modernity commodifies human beings, with sophistication and precision never seen before in human history. In a capitalistic society, every "human resource" (hideous words, if you think about it) comes with a sticker price, precisely indicating his/her value. A lawyer costs $350 an hour; a stripper, $20 a song. And inevitably, for a large number of humans, the value is zero or near zero--useless, therefore worthless. Likewise inevitably, for even larger number of humans, the sticker price that are given to them (which is something that they can only partially control) is far lower than their own ideas of their intrinsic value. This discrepancy pushes such people to view themselves as worthless. The next step is easy--the commodity whose existence no longer matters proceeds to end its existence. In 2011, there were two "suicide clusters" that made the news in Korea: at the prestigious KAIST University, and within the labor union for Ssangyong Motors. The members of those two clusters are very different. KAIST students are highly educated, generally belong to upper-middle class and are on the track to become Korea's elites. Ssangyong Motors workers are blue collar, less educated and a part of Korea's lower-class masses. But ultimately, they killed themselves for the same reasons. KAIST, an acronym for Korea Advanced Institute of Science and Technology, is Korea's premier college for science and technology. The school was founded in 1971, with an explicit purpose of attracting and educating Korea's brightest minds with the cutting-edge technology. It accepts less than a thousand undergraduate students every year. KAIST experienced a rash of suicides in the early part of 2011. On January 8, a freshman was found dead on KAIST campus, apparently killing himself with sleeping pill overdose. On March 20, a sophomore killed himself by jumping out of his apartment. On March 29, a senior at KAIST jumped out of his apartment. Finally, on April 7, a KAIST sophomore committed suicide by jumping out of his apartment. Even in Korea, where the people are desensitized to the news of suicide, these suicides caused a stir. These students were, literally, geniuses. They had everything to look forward to in their lives. Why would they kill themselves? In fact, this was not the first rash of suicides that KAIST experienced. KAIST also experienced a suicide wave between 1995 and 1996, during eight students attempted suicide (and six in fact died.) At the time, KAIST was running a brutal survival game: every year, 15 to 18% of KAIST students received a warning for failing too many classes. If a student received three warnings, she was expelled. As a result, KAIST expelled nearly 9% of its students every years. In response to the suicide trend, KAIST relaxed its policy: the threshold for a warning became significantly higher, and the expulsion came only after three consecutive warnings rather than three warnings overall. As a result, the suicide rate at KAIST between 2000 and 2005 at a level similar to other colleges in Korea. The drive for competition again ratcheted up in 2006, when Seo Nam-pyo, formerly a professor at MIT, was appointed as the president of the university. 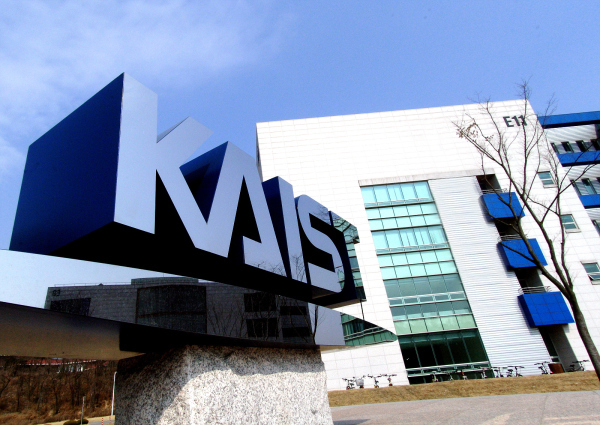 Seo focused on improving KAIST's international standing and, by and large, he was quite successful: Times Higher Education ranked KAIST at 198 among the world's colleges in 2006; the ranking was 132 in 2007, 85 in 2008 and 69 in 2009. KAIST also developed extremely promising electronic vehicles that garnered international acclaim. To achieve this dramatic improvement, Seo implemented two controversial measures. First, Seo required that most classes to be taught in English. By 2010, 91% of KAIST's classes were taught in English. Given that bilingualism is a key to the global economy, and especially for a trading economy like Korea, this was not a bad idea. But practically, the professors were unable to effectively teach all of their knowledge, and the students were unable to keep up completely. KAIST professors called the measure "insane," and KAIST students would write an open letter to their professors, begging for classes in Korean. Second, Seo implemented a system in which a student with a lower grade had to pay higher tuition. Because KAIST is a national public university, the tuition is free; instead, every students pays a small fee of around KRW 1.5 million (~ $ 1,300). The new system made each student add KRW 60,000 for every 0.01 GPA point below 3.0. That is, a student with the overall GPA of 2.0 was faced with another KRW 6 million in fees per year. Because KAIST was graded on a curve, this meant that a quarter of the school automatically had to pay additional fees. The second measure--dubbed by the media as "penal tuition system"--is precisely the type of commodification that came to dominate Korean society since the 1997 financial crisis. It was not enough to give a poor grade; there was a precise price tag for failure. It did not help that KAIST students were made up of the smartest people that they themselves knew of, or that KAIST was a small school where all students lived next to one another in a cluster of dormitories. Even for these geniuses who breezed through the grueling Korean educational system, this was too much. In the face of media scrutiny and open expression of dissatisfaction from professors and students, president Seo backed off a bit. The "penal tuition system" was scrapped, although the English lectures remained. Seo finished his term in late 2012, and was succeeded by Dr. Steven Kang, former chancellor of University of California at Merced. At the same time as KAIST students were ending their lives, Ssangyong Motors labor dispute has been claiming people's lives as well. But because Ssangyong Motors is so unlike KAIST, it was not until mid-2012 that this became a major social issue in Korea. Ssangyong Motors [쌍용자동차] is a minor automobile company in Korea. Established in 1986, it was mostly a niche manufacturer specializing in producing SUVs. Although the company experienced a decent amount of success, it would fall on difficult times during the 1997 financial crisis. (Yes, that thing again.) Ssangyong Motors was initially sold to Daewoo Motors in 1998, but soon fell into the custody of Korean government after the Daewoo group disappeared in 2000. Ssangyong Motors was then sold to Shanghai Motors in 2004. Despite the frequent changes in ownership, Ssangyong was hanging on--until the 2008 global financial crisis. On January 2009, the board of directors of Ssangyong Motors--which was controlled by Shanghai Motors--voted to declare bankruptcy and undergo a court-supervised restructuring process. After an audit, Ssangyong Motors decided to conduct a mass layoff; 2,646 workers, which was 37% of all employees and 43% of the factory workers, were scheduled to lose their jobs. 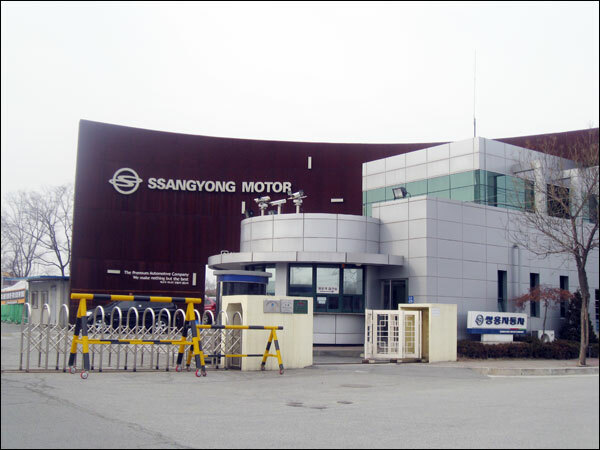 To stave off the mass layoff, the labor union for Ssangyong Motors offered a compromise: the union would reduce the length of the shifts (and thus the salaries) so that everyone can continue working, and would serve as a guarantor to an emergency loan of around $100 million by putting up the union's pension fund as a collateral. When the management rejected this compromise, the union went into a strike. As a renowned Korean novelist Gong Ji-yeong put it, a grim game of musical chair began. To break the strike, the management began telling the striking workers that those who quit the strike would keep their job. For those who did give into the management, their ordeal was only the beginning. As a condition for keeping their job, they were told to stage a counter-protest to the striking unionists. The first death happened in April 2009. Oh Chang-bu, a contract worker who was pregnant was twins, miscarried as a result of the stress of being laid off. Dejected, she committed suicide soon thereafter. Two more union workers would die from stress-related brain aneurysm in May and June. In July, another union worker would commit suicide after agonizing over the fact that he had to participate in a management-staged counter-protest. The shadow of death reached the workers' families as well. Also in July, a wife of a striking laborer committed suicide by jumping out of the window. The Ssangyong Motors strike would elevate in violence over time. In June 2009, the management sent in hired goons into the factory and began beating the workers. In the ensuing skirmish, approximately 90 people were injured. In July, the management cut off the access to the factory, as well as any supply of food and water. The management also hired a helicopter and sprayed liquid tear gas over the factory. Covered in the stinging tear gas, the workers had no water to wash themselves or quench themselves in the muggy Korean summer. Finally, the police entered the factory, beating and firing rubber bullets and tasers at the union workers. The strike was over. The final "compromise" was that 48% of the workers who were set to lose their jobs would be on "unpaid leave" rather than complete dismissal, and no charges against the workers would be filed. The management literally broke these promises the moment the strike was over, as the police arrested 96 laborers. Nobody who was put on "unpaid leave" would regain his job. Those who managed to keep the job worked murderous hours, as they had to handle the work that was left behind by nearly half of the factory's manpower. In November 2011, Ssangyong Motors emerged out of bankruptcy and was sold to Mahindra Automotive of India. 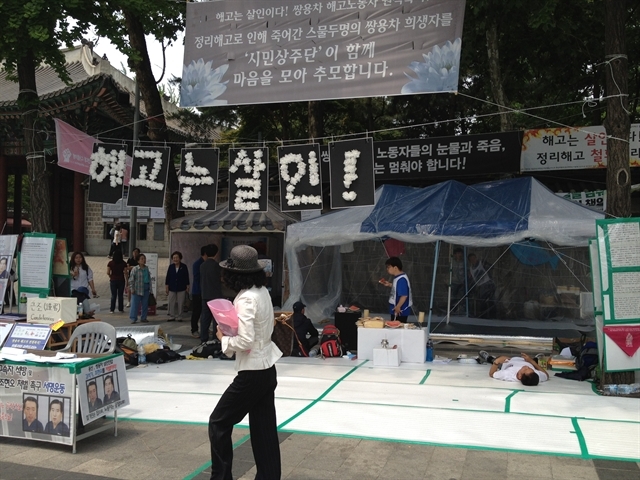 To this day, the laid off Ssangyong Motors workers are protesting in Seoul, by setting up a memorial for the 23 workers who died. They demand the laid off workers to be re-hired, and mass layoff to be abolished. Memorial for Ssangyong Motors labor union. The large letters say: "Layoff is Murder." The story of Ssangyong Motors is an epitome of how Korean society changed since 1997, and how that change has been driving ever more Koreans toward suicide. I have received many objections so far that essentially said there was something about traditional Korean culture that encouraged suicide. Not so--because if that's the case, how does one explain the fact that, in the 1980s, Korea enjoyed one of the lowest suicide rates in the industrialized world? Until 1997, Korean economy was insulated from the harsher form of capitalism. Thanks to strong unions, employment was stable. Once you were in, you were in for life. Such job security is much more than just having money. It gives a sense of community and purpose, precisely the things that keep the suicide rates low in the pre-modern societies. Before 1997, working for a Korean company meant being a part of a team with several thousand members, with a genuine sense of camaraderie fostered through union activities. Facing this situation, it is very easy for the fired workers to begin blaming themselves. And in the world of neoliberal capitalism, such blaming is actually encouraged. (It would interrogate: "Why didn't you get more educated? Why didn't you acquire more skill? If you were just a little smarter, tried just a little harder, you would not be in the situation that you are in. Whatever happened to individual responsibility?") Even in a recession in which millions of competent people may lose their jobs through no fault of their own, the sway of such narrative is powerful. Once a worker who is fired and unable to find a new job buys into the narrative, his life is practically over. His social value became zero; he is a commodity whose existence no longer matters. This is the conclusion of the series on suicide in Korea. One last takeaway: as a Korean American, I would like to urge Americans to take a close look at what happened in Korea for the last 15 years, because that is what will happen in America for the next 10 years. The social devastation of the 1997 financial crisis reaches far beyond the elevated suicide rate. In Korea, it has caused the middle class squeeze, ever-higher pressure for education (as it is seen as the only way to improve the worth of human capital,) higher rate of violent crime and more dysfunctional political culture. The sociological consequences of America's transition into the lean economic times probably will not be as drastic as Korea's, as America has a longer experience of living in modern capitalism. But many of the social ills that Korea went through as a result of its financial crisis are appearing in America now. To address them, America would do well to look to what happened in Korea, and how Korea succeeded and failed to address those issues. Words alone cannot describe how insightful this article is. I enjoyed this article quite a bit. My personal belief is that Americans are very good at finding... alternate measures of self-worth and as a result are less suicide-prone. There is also more religious objection to suicide here. But I guess we'll see. Thank you for this article, and the whole series of course. I'm torn between agreeing with this article and finding it annoying. Agreeing, because I do think capitalism causes commodication of people, but not agreeing, because individualism, properly understood, is the opposite of that. Individualism does not mean not caring about other people - even if capitalism leads to the latter and mislabels it the former. It means self-reliance, standing up for one's own principles, and expression of one's individuality, yes, but not at the expense of the rights of others and therefore it is not incompatible with being a good family member or member of society; in fact, a good individualist is arguably better able to meet social obligations and supply social needs - as a healthy society is one which allows individuals to find fulfilment. If individualism has a bad name in Korea, I suspect it is because of its unfortunate association with capitalism, and perhaps also because it is incompatible with something Korean society values highly: conformism. Ironically, - and I'm sure The Korean is aware of this - the pressure to conform just adds to the stresses coming from competitiveness and capitalism that, sadly, lead many Koreans to suicide. If The Korean dislikes individualism, however, I can understand, because it is so often misused to oppose social or political reforms. Just to take one example, they say having a healthy diet is a matter of personal responsibility, which conveniently lets food companies and agribiz off the hook - they can flood the market with cheap (because subsidized), unhealthy, misleadingly advertised products and take zero responsibility for the consequences. But, of course, that doesn't mean we should be against personal responsibility - and nor should we blame individualism for a high suicide rate! I think "individualism" comes with many shades, and I am rather fond of most of the shades. But I do think that at least one shade of individualism (that is, refusal to consider the individual's relations to other individuals) is a necessary condition for commodification, which is the thing that I really find pernicious. I am also deeply suspicious when people direct the words "individual responsibility" to those people who are the most exposed to the adverse currents of social events. In that sense, I don't think we would disagree much. Thanks for the article, Korean. I really feel bad for these people who feel like they have to resort to suicide. But I feel even worse for the family they leave behind. What about the wife and the children of these Ssangyong workers? I can't imagine how much they will suffer knowing their husband/father killed himself and left them behind. How is the wife going to pay the bills and educate the children now all by herself? What about the children who will grow up poor and without a father? And these students at KAIST. What about their parents? Their siblings? To me, it is the ultimate selfish act. I can understand it if someone has a history of depression or mental illness and can't think straight. But to commit suicide simply to end one's troubles seems selfish, especially when they leave behind a family who will mourn and be destitute. One can argue that anyone who attempts suicide is obviously not thinking straight. Perhaps, but I do think there is a difference between people who chronically suffer from depression vs. people whose unfortunate circumstances cause them to attempt it. What do you think is the solution to all this? More mental health counseling? A change in culture as VB mentioned? A better economy? Are there suicide statistics on countries that have become rich and then had deflated economies? VB, I guess Korean dramas have moved on from amnesia/leukemia to infidelity/suicide. That is why I loved Dae Jang Geum, Mo-rae-shee-gae, and Yuh-Myung-Ae-Noon-Dong-Ja (an old one about Comfort Women and WWII) - sorry, don't have a Korean keypad. Everyone actually seemed normal in those dramas. Helen, could you link that drama about the Comfort Women for me by chance? I've been researching individual stories for a short story and would love to see that. Thanks! Hi, I don't see it on Youtube. It's called Eyes of Dawn (여명의 눈동자 (黎明의 눈동자) / Yeo-myoung-eui Noon-dong-ja) and stars Choi Si Ra, Choi Jae Sung, and Park Sang Won. Here is the Dramawiki link -- http://wiki.d-addicts.com/Eyes_of_Dawn. I don't know where you would find it because it was made back in 1981 but it was really, really good. It is about Korean comfort women and then the Korean War... asks why North and South Korean became enemies when we didn't need to be... along the lines of Front Line (a recent movie that asks the same question). When we look at the entire human history, the individualism of the West has a short history--around 250 years or so. And when the West transitioned from collectivism to individualism (by going through industrialization and entering into modern capitalism,) it experienced a huge spike in suicide rate, just like Korea is going through now. Is suicide in Korea "cultural"? In one sense you can say that--Korea's recent history formed a culture, which is currently contributing to elevated suicide rate. But is suicide in Korea "cultural" in a sense that it is connected Korea's tradition that stands out uniquely from all other countries in the world? No. You cite the gender roles under Confucianism, but you cannot possibly say that Confucianism is the only philosophy that promoted strict gender roles, nor can you say that there is no other society than Korea that historically experienced strict division of gender roles. I agree. I don't think gender roles is the cause. But what about chaemyun? When a man loses his job, he loses face. Same with those KAIST students. They lose face when they get bad grades. They are too ashamed to face others and feel that they're no longer worth anything in this society. It's different from collectivism. Germany was a collectivist society but I don't think the concept of "face" was big in that culture. I have to believe this is what is contributing to the high suicide rate. Think about this: 체면 has been important in Korea for at least five hundred years, potentially a thousand years. It certainly has been consistently important for the last 30 years. Then why was Korea's suicide rate so low in the 1980s, and so high in the 2010s? If 체면's importance is consistent, why the change at all? Stated differently, if Koreans cared more about "face" compared to people from other countries, shouldn't Korea's suicide rate constantly above international average? As to the second question, I think Korea is going from pseudo-individualism to full-blown, naked individualism. I would like to clarify that I don't think that Korean culture by itself can explain the high rate of suicides. My feeling is, however, that in some ways it contributes to making the final decision of an individual an easier one. Culture is not constant though and so I believe this may change the same way it did in the West. Korean Confucianism is a very peculiar one - you wrote about it extensively yourself. As that it defines the Korean culture and Korean culture only. I wasn't talking in general terms. Intriguing. Will you be writing another blog post on the solution to this social problem? Wonderful article. I'm reading "The Twilight of American Culture" for a class this semester and was blown away at the statistic, "Of the world's one hundred largest econonomies ... fifty-one are corporations rather than countries, and the five hundred largest corporations account for 70 percent of world trade." To me, this seems to be the root of the problem with "modern capitalism". The corporations at the top are powerhouses without conscience and only one goal, making more money. We complain about the effects all the time, the outsourcing of jobs, the bombardment of consumer culture, and the pressure to keep up appearances at the risk of drowning in personal debt. I think you're right in alot of ways. Its happened to the U.S. more slowly, we're sinking without realizing it and so we don't struggle and give up hope so quickly, but if we keep on the path we're on now we'll end up in the same place. Or maybe we'll just numb ourselves with more reality tv and call it a day. I agree but there are people like Bill Gates, Warren Buffet, Bloomberg and many others who end up giving most of their wealth to good causes. It would be good if more people did the same. Most of these corporations are owned (or with a controlling number of shares) by a very small number of individuals or families, just as Korea's chaebol are, but with a lower public profile. These are the real rulers of the world. I interpreted this sentence from the first installment to be your thesis, "Korea, as a society, condones an incredible level of ruthlessness and cruelty to those who lose out in the social competition." Not only did you back away from that argument which places responsibility on Koreans themselves, you ignored it for the next five installments, choosing instead to point to Korea's unexceptional suicide trend and trauma from 1997. The series was informative, but could have been much better had you elaborated on that crucial sentence. I backed away from that sentence? I disagree. Didn't I just write a big post about smart students getting monetary fines for poor grades, and union members getting brutalized by the police? I think I elaborated what I meant by that sentence by providing real-life examples to finish the series. I think your last paragraph is what is causing a bit of the confusion. I also feel like you started off by focusing on Korean culture but end up concluding that capitalism/the middle class squeeze is what is causing the high suicide rate (because this piece focuses mainly on capitalism). Isn't it a combination of both, though? I keep reading that the Korean populace has incredibly high debt. That is scary. Anyway, you wrote a wonderful series and I appreciate all the info. It would be good if we can consider the prescriptions but I'm sure you're busy writing about the new sanctions on North Korea, which should be fascinating. I don't think the sanction goes far enough but that's another matter. - Greenland is #1. It is triple the rate of Korea (#2). Is it too cold perhaps? Too cloudy and gloomy? - Island nations (particularly those in sunny areas with nice beaches) have the lowest rate. Haiti, the poorest country in the world, has the lowest suicide rate! I guess nice weather, nice beaches, relaxed lifestyles, and low expectations (meaning they don't care to become the next Bill Gates) = happiness? - Hispanic countries and Middle Eastern/Muslim countries are the next lowest. Is it because of the sunny weather or is it cultural? - Then you have a cluster of industrialized European nations in the middle to higher category. US is #34, smack in the middle of these European countries. - Then interesting, approaching the top are the former USSR states. I wonder if this fits with the Koreans' getting-rich-quickly theory since these countries probably became more industrialized after the the Cold War. - Then you have the top category of East Asian nations (with a few random ones sprinkled in between). South Korea is #2. China is #7. Japan is #8. While I agree with the Korean that capitalism/industrialization influence the suicide rate, I have to believe there is something cultural about this. Maybe it's the combination of expectations, chaemyun and industrialization. Confucian philosophy is very hierarchical but it allows people to move up in the hierarchy through education and hard work. It also emphasizes harmony and conformism. So, you have a bunch of Koreans, Chinese and Japanese who have high expectations of themselves (through education and hard work, they can become rich (and provide for their families - as Anna mentioned). They end up doing well while the country becomes rich. Then, suddenly, there's an economic stagnation and they lose their jobs, they can no longer keep up with the Kims, Chens and the Takayoshis and they can no longer conform to the upper society they are used to, their kids can't go to the best schools, people look down on them, and their chaemyun suffers because Asians care about that a lot more than western cultures. They consider it a personal failure. And it leads to suicide. I think this is what is happening. No, it is about vitamin D levels. When we eat proper foods/get enough sunshine, we are okay. Once the shift in nutritional intake occurs (due to wide-spread prevalence of processed foods), one nation's mental health dwindles and the suicide rates skyrocket. I thought your case study of KAIST was interesting. I went to Caltech, where brilliant students also killed themselves. At an institution like that, it is easy to become caught in an bubble, comparing yourself only with the people immediately surrounding you, without seeing that everybody there a lot of talent and potential. How do people think about the school's role in promoting suicide in Korea? For example, when Caltech students commit suicides, their parents often sue the school. They do so in the belief that the school "should have done more" to prevent the suicide and should have notified the parents of their precious darling's precarious mental health. Is there any kind of belief in Korea that universities and institutions should have plans to protect students from suicide? It is entirely possible that The Korean's thinking changed as the series progressed, he consumed more research, and did more thinking. This blog post series constitutes enough information for an academic research article - as someone who's done academic research, let me say that one's thinking changes as the research process progresses. But ultimately, The Korean is right - if you want to explain some change in society, you MUST account for the time-order element: why do suicides spike after 1990's and not before? The "culture" argument doesn't answer that time-order question, unless one wants to argue that Korea's culture changed in the 1990's. In fact, The Korean IS arguing that there has been some changes in Korean society which may extend into Korean culture - Korean culture has become more individualistic and this has increased the feelings of "anomie" (normlessness, sense of lack of social belonging), as the sociologist Emile Durkheim put it.